This series will be about the history of the Daleks within the fictional Doctor Who universe itself. My motto is that EVERYTHING IS CANON! I will try and include all Dalek stories even if they are contradictory to one another. For instance I will try and fit all 4 origins of the Daleks together rather than simply pick one. Obviously I will have to fill in a few gaps a long the way but pretty much everything that you read here comes from a licensed Doctor Who story and not just from the television series. This history will take all forms of spin off material into account from the Big Finish Audio’s to comic books to stage shows. Remember EVERYTHING IS CANON! The Daleks are the most evil, dangerous and feared creatures in all of creation. Originally from the planet Skaro, the monsters cut a bloody swath through several galaxies across millions of years, destroying entire civilisations and wiping out whole species. Gathered here for the first time are the full Dalek Chronicles. The Dalek Chronicles are small glass cubes with pieces of micro film inside them that contain information about the history of the Daleks (as well as our own future). It is not known who sent them. David Whitaker suggested in his extensive study that they may have come from a Dalek museum that exploded in the future. Russell T Davies meanwhile believes that they may have been sent intentionally from the year 5 billion. Whatever the case the first ever Dalek Chronicles cube was discovered by the late great Terry Nation in his own garden in the year 1963. Nation managed to translate the information that was contained within this small cube with the help of his friend David Whitaker. Other Dalek chronicles would later be discovered and translated by a number of other prominent experts on alien life over the years, including Ben Aaronovitch who managed to translate the cube that told of the destruction of Skaro. Russell T Davies also discovered the cube that told of the time war, which helped to explain the circumstances surrounding the Dalek Invasion of Earth in the year 2009. Prior to this invasion many people did not believe the information contained within the Dalek Chronicles to be real, and indeed the study of them was a very obscure, fringe area of research. After the Dalek Invasion however searches for more cubes became widespread across the entire world. The most recent Dalek chronicles were discovered and translated by Steven Moffat who helped to shed more light on the time war including for the first time how it actually ended. It is not known what effect our knowledge of this information will have on our future. It might change it, or perhaps knowing this information and trying to change it will ultimately end up creating the very future we hope to avoid. Whatever the case at the very least this knowledge will hopefully alert any of you reading to the danger of the Daleks. Ever since they first came from the sky on that fateful night when the earth was transported half way across the universe, mankind has been desperate to know the truth about these mysterious and cruel invaders. Now for the first time thanks to the tireless work of some of the most renowned experts on alien life and time travel theories such as Terry Nation, David Whitaker, Russell T Davies and Steven Moffat their full history can be compiled here. The Daleks originated on the planet Skaro. Not much information has been given on the early history of Skaro before its two dominant humanoid races, the Kaleds and the Thals evolved. It is known that it was the twelfth planet from its sun in its solar system. It also had a similar atmosphere, climate and gravity to that of the planet earth. Life also developed in a similar fashion on Skaro too. Gigantic Dinosaurs evolved on the planet as did humanoid life forms. Unlike on earth however the humanoids where shown to emerge at the same time as the Dinosaurs. At some point the single humanoid race split off into four separate species. The Dals, The Kaleds, the Thals and the Tharon’s. The Dals were said to be teachers and philosophers, whilst both the Thals and the Kaleds appear to have been warriors. Almost next to nothing is known about the Tharon’s. Both the Dals and the Tharons were driven to extinction by the Kaleds. Though a few pieces of Dal culture would survive and become integrated by the Kaleds. The Kaleds would later become locked in a war with the Thals. It is not known what caused this war, but considering the fact that by the time it started the Kaleds had already exterminated two entire species on Skaro, it seems likely that they were the instigators. At the same time however it is known that the Thal culture was also brutal too and thus it is possible that they may have been the aggressors. Perhaps the Thals grew scared after seeing what the Kaleds did to the Tharons and the Dals and declared war on them first for their own survival. Whatever the case both races waged an all out war against one another that lasted for over 1000 years. During the course of this war atomic and nuclear weapons would be deployed by both sides against each other which slowly but surely destroyed the surface of the planet. Turning it from a beautiful green paradise into a barren, dead wasteland. The Kaleds and the Thals developed all kinds of devastating weapons to use against one another such as the “Hand Mines”. The nuclear weapons eventually polluted the air of Skaro itself and caused both the Kaled’s and the Thals to slowly mutate. These mutations who were christened “Muto’s”, where banished to the wastelands of Skaro where they mostly perished, though some of them managed to survive and became savage creatures. Killing anyone who dared to venture into the wastelands. The limited resources also meant that many Kaled and Thal soldiers had to resort to using more primitive weaponry too. Near the end of the war emerged an important figure who would not only change the face of Skaro but of the very universe itself forever. Davros. Davros was the son of Lady Calcula and Councillor Quested. The two had been having an affair which ultimately resulted in his birth. He also had an elder sister Yarvell. At some point during his childhood Davros became lost in a Handmine field. With the previous Kaled soldier who tried to save him being killed, Davros was soon approached by an older looking man with silver hair, who threw a sonic device to him that allowed them to communicate. At first the man tried to give him advice that would help him, but later after Davros told him his name, the mysterious stranger left with a look of horror on his face. Little did Davros know the man was in fact his future archenemy. The renegade time lord known as the Doctor. Ultimately the Doctor would return brandishing a weapon. He told Davros that he was going to save his friend the only way he could and shouted “Exterminate” before blasting the hand mines with the weapon saving Davros. The Doctor then told Davros that he had shown him mercy and took him by the hand, helping him to get home. Davros as a boy comes face to face with his saviour and future archenemy the Doctor. Davros was discouraged from his interest in science by his step father Colonel Nasgard who wanted him to become a soldier. Nasgard mistakenly believed himself to be Davros’s biological father. Davros would later join Military Corps but he was very quickly put in charge of developing new weapons. He came to believe in sharp contrast to his sister who was a peace activist that the Kaleds must completely and utterly exterminate the entire Thal race forever. Later after the death of his entire family except for his mother, Davros was able to join the Scientific Corps. Some time after his mother died, Davros was horifficly disfigured in a Thal bombardment on the Kaled dome. After the explosion, Davros was left without his left arm his legs, entire lower body, and even his taste buds. His eyes were also so badly damaged that he could barely open them. Davros was placed in a special life support machine which kept his body in a kind of stasis. This prevented his body from breaking down and ironically prolonged his life by many years. His life support machine also meant that he no longer needed any nourishment either. An eyestalk bulb was also placed on his forehead which allowed him to see through this third eye. Davros would later assassinate the members of the Council of Twelve, the Kaled head’s of state. Following their demise, Davros became the most senior citizen within the Kaled Dome and thus began to wield considerable power. He would later be made the head of the Kaled Scientific elite itself alongside his associate the ruthless and sadistic Nyder. Davros soon discovered through his experiments that the Kaled people where destined to continue to mutate. As the air of Skaro itself had become polluted there was no way to reverse the mutation process. Thus more and more mutations would continue to be born over the generations, until eventually the entire species itself would be nothing but mutants, and they would continue to mutate until they eventually reached a final mutated form. Davros wanted to find out what the final result of the Kaled mutation cycle would be, and ensure a way for it to survive. He took living Kaled cells and subjected them to large amounts of radiation that was present in the air of Skaro causing them to mutate. Many of these creatures Davros created where banished to the waste lands after he was done with them just like the muto’s. Whilst most of them died others did manage to survive, but most of them degenerated to the level of savage animals. Davros eventually discovered what it was the Kaleds were destined to mutate into. Slimy, amorphous, Octopus like blob creatures. Realizing these Kaled mutants could not survive on their own Davros soon began to develop war machines that could house them. At the same time he also began to experiment on their minds. Davros removed all emotions from these mutants brains that he believed were weaknesses in the Kaled race. Emotions such as love, pity and compassion. He also programmed into their minds a strong hatred of all other life forms that were different to them. Davros did this as he believed that in order to survive the Kaled mutants would need to be aggressive to all other life forms. He felt that one race must dominate all the others. In his own twisted way Davros believed that only then could you have peace as the one superior race who ruled, would do so benevolently. In truth however deep down Davros who had been driven insane by the accident that scarred him, really just longed for power and even revenge against the universe itself for what had happened to him. He hoped that his new creations, whom he considered superior to his own race the Kaleds, would allow him to achieve this. The Kaleds did not believe that life existed on other worlds. Despite this however Davros though dismissing it in the public eye considered it a possibility. He had never found out just who the man who had saved him as a child was and how he had suddenly managed to appear out of nowhere and then vanish once again. He also had analysed the mysterious sonic device that the stranger had left with him, and found it to be in advance of anything that the Kaled people had developed. Over the years he came to believe that this man was in fact an alien from another world. Thus he programmed into the Kaled mutant’s the possibility of there being life on other planets, and that if they did exist then they would have to conquer them to in order to protect their own race from any threats to it. Davros essentially removed all emotions from these Kaled’s brains except for hatred. Davros came to name his creation, the Kaled Mutant in the robot shell, a Dalek. The word Dalek actually came from the language of the extinct Dals. Davros had managed to obtain a copy of The Book of Predictions which had been written by the Dals. 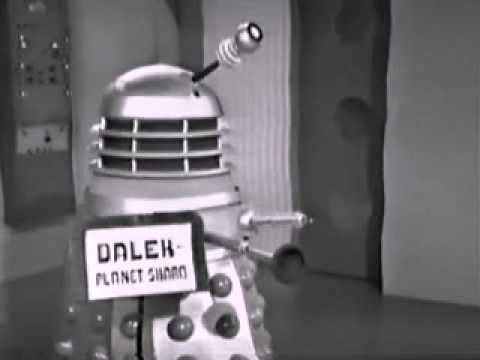 It contained a prophecy that stated that ordinary men would one day become gods, with Dalek being the Dal word for god. “And on that day men will become as Gods” The first Daleks created by Davros. As Davros carried on with his experiments. Out in the wastelands of Skaro appeared a man who would stop at nothing to prevent the evil he was creating from being unleashed upon the universe. The Doctor. This version of the Doctor was a much earlier incarnation than the one who had rescued Davros as a boy. This was the Fourth Doctor who had been sent to Skaro by his own people, the time lords. The time lords had foreseen a version of the future where the Daleks had destroyed all other life forms in the universe. In order to avoid this the time lords decided to send the Doctor back in time to tamper with Dalek history by altering their development, slowing it down or even if need be wiping the Daleks from history. The Doctor and his two human companions Harry and Sarah were given a time ring which would allow them to be reunited with the TARDIS, though only once their mission was completed. The three of them where soon separated with Sarah being kidnapped by the Thals and the Doctor and Harry ending up in the Kaled dome. By this point only one Kaled and Thal city survived. All the others had been destroyed. With these two cities also now being all that was left of either the Thal or the Kaled races in general. The Thals where preparing a final strike against the Kaled people. They had created a rocket that they believed would be powerful enough to destroy the entire Kaled race. Little did they really know that it would not be able to barely scratch the surface of giant dome that covered the Kaled city. The Doctor meanwhile managed to make his way into the Kaled bunker. After almost becoming the first victim of a Dalek when Davros tried to use him as target practice, the Doctor with the aid of a Kaled scientist named Ronson, was able to collect evidence of Davros’s experiments which he presented to the Kaled government. Despite his influence the Kaled government could still override Davros if they wished too and after what the Doctor showed them they intended to shut down his experiments. Unfortunately for them Davros would subsequently betray the Kaleds. He gave the Thals the secrets they needed to penetrate the Kaled dome which would allow their rocket to destroy their city. 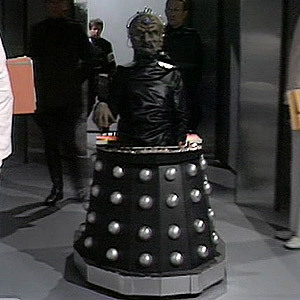 The Thals believed Davros’ lies that he simply wanted to bring an end to the war on their planet as they were in Davros’s own words “hungry for victory“. The Thals launched their rocket despite the Doctors attempts to stop them. With the Kaled city gone all that remained of the Kaled people was Davros himself and the scientists in his bunker. Davros subsequently claimed Ronson was the traitor and had him gunned down by the Daleks. Davros sent a few Daleks to the Thal city. The Thals where celebrating finally triumphing over their enemies and caught completely off guard, though even without the element of surprise the Daleks were still too powerful for them. The Daleks began to slaughter their way through the Thals without mercy gunning down thousands of them and levelling their entire city. A few of the Thals managed to escape and the Doctor told them that they would need to attack Davros’ bunker in order to defeat the Daleks. The Doctor would later be captured however by Davros alongside his two companions. Davros had discovered that the Doctor had not only been an alien but a time traveller after reading Ronson’s interrogation and examination of him. Though the Doctor tried to warn Davros of the suffering the Daleks would cause. Davros did not care and instead was only interested in learning of the times the Daleks lost and demanding to know the reasons for it. Davros proceeded to torture both Sarah and Harry in order to force the Doctor to tell him the reason for every Dalek defeat. Though the Doctor was forced to comply he later managed to destroy the tape Davros had made. The Doctor soon formed an alliance with several of Davros’ own Kaled scientists who like Ronson had become horrified at what he was creating. At one point the Doctor had the option of actually destroying the Daleks but he ultimately gave it up. He wondered if morally he had the right to exterminate an entire species at birth, and also that if perhaps some things might even be better with the Daleks as they in the future would unite many races due to their mutual fear and hatred of the Daleks. Ultimately whilst the Doctor did not destroy the Daleks he still managed to prevent the Time Lord’s vision of the future from coming to pass by not only destroying much of Davros’s work, but also with the aid of the Thals trapping the Daleks in the Kaled bunker by causing an explosion which buried it under thousands of tons of rubble. The Doctor estimated that it would take them thousands of years to escape which would give other species enough time to catch up with them, and stop them before they could reach the point where they could wipe out all other life forms. All of the Kaled scientists that had turned on Davros had been subsequently exterminated by the Daleks. With Davros and the Kaleds who had remained loyal to him having been trapped in the bunker with the Daleks. The Daleks then subsequently turned on their creator. They proceeded to exterminate Davros. Davros ironically just before his apparent death begged them to show pity to all of the men who had remained loyal to him, including his right hand man Nyder. After exterminating Davros the Dalek who had assumed leadership of the rest declared. The Daleks immediately tried to make good on that promise and began trying to find a way to escape from their prison. Davros and the other Kaled’s bodies meanwhile they merely stuffed into an old locker. Little did the Daleks know that Davros was not completely dead. His life support machine the very thing that had kept him alive for years placed him in a state of suspended animation, whilst it slowly began to repair many of his organs that had been damaged by the Dalek’s death rays. The Thal’s meanwhile with their city destroyed by the Daleks soon left the area to make a new start whilst the Doctor, Sarah and Harry left Skaro using the time ring. 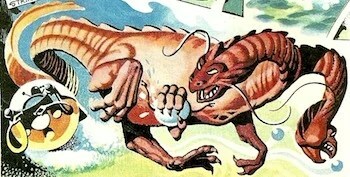 The surviving Thals would flee to Skaro’s second continent. They found this continent less irradiated than the one they and the Kaled’s had lived on for centuries, and they were actually able to grow food there. Meanwhile little did the Thal’s know some of Davros’s early experiments had survived. The mutants he had cast out, whilst most of them had perished and most of the few who had survived had degenerated in animals. A few were still nevertheless able to retain their intelligence. These Kaleds were not quite as mutated as the Daleks. Their shape was still humanoid, but they were horrible, squat, blue skinned, goblin like creatures. The blue skinned humanoid Daleks. They were early experiments of Davros, not quite as far down the Kaled Mutation cycle as his finished Daleks trapped in the bunker. These Kaled mutants remembering who had created them soon made their way back to Davros’s bunker. Most of the bunker was gone, but there was still a few upper sections left unburied. There the Kaled mutants found notes from Davros about the Kaled mutation cycle and the Daleks as well as even notes about the battle armour he intended to house them in. They declared themselves Daleks after what they read in Davros’s old notes. The creatures whilst sentient had no idea what they were before discovering Davros’s papers. These blue skinned humanoid Daleks soon set about rebuilding the old Kaled city that had been destroyed by the Thals. Within a couple of decades the humanoid Daleks had completely rebuilt the old Kaled city. Led by a man named Zolfian, the Daleks still sought to exterminate the Thals. They had come to worship Davros almost as a messianic figure. Thus they adopted his xenophobic beliefs as their own. They were not conditioned to believe that all other life forms were inferior like Davros’ Daleks as he had not begun to experiment on their minds when he discarded them. Instead they simply adopted it as their main belief. With the Thals now living on another continent the Daleks began launching missiles at the Thal city. The Thals meanwhile had forsaken their old war like ways due to their previous conflict. They had also found a way to prevent themselves from continuing to mutate too. The Thals offered the Daleks a chance for peace, but the Daleks flat out refused and thus in order to protect themselves the Thals were drawn into yet another war. Both races began to launch missiles at one another from their continents, though very few if any wherever able to actually hit their targets. Due to the lack of resources it was hard to develop effective weaponry. Eventually the head of the scientific elite Yarvelling soon began to construct a robotic war machine based on Davros’s old design for the Dalek casings. Unfortunately Yarvelling was nowhere near as great a scientific mind as Davros. His Dalek casing was not only not as powerful but also had trouble moving on non metallic surfaces without breaking down. Yarvelling couldn’t find a way for these casings to power themselves like Davros had done. Yarvelling reveals his new War Machines based on Davros’s old design to Zolfian. Zolfian meanwhile had planned to use a new form of neutron bomb that he believed would have been capable of destroying the entire continent that the Thals lived on. Zolfian wished to pollute the whole continent to ensure that no thals could live there afterwards. All of the Dalek resources were being pulled into this doomsday weapon. Despite this however Yarvelling continued to work on his war machines hoping that it could be used to eradicate any Thals who may have survived Zolfian’s weapon. Yarvelling did not have much faith in Zolfian’s weapon. He believed that it was unstable and actually could threaten all of Skaro itself. Unfortunately Zolfian eager to see the destruction of the Thals once and for all refused to listen to Yarvelling. Later a storm would strike the Dalek city and set the bomb off. The bomb not only consumed the city of the Daleks, but virtually all of Skaro itself. The bomb was far more dangerous than even Yarvelling had predicted and it managed to bring about the final destruction of the planet Skaro. Most of the Thals were exterminated in the blast, whilst the few who survived were horribly mutated. They would work hard to create a drug that could allow them to survive the irradiated air of Skaro and even reverse the effects. After Zolfian’s bomb the air had now become completely toxic to the point where without the new anti radiation drugs, the Thals could not survive for more than a few days before dying of radiation poisoning. As for the Daleks both Zolfian and Yarvelling had managed to survive the blast by finding shelter in an underground bunker which also protected them from the irradiated air. Eventually after over a year underground the two men decided to venture to the surface in order to see if there were any other Dalek survivors. They were soon confronted by a surviving Dalek who was now housing himself in one of Yarvelling’s war machine’s based on Davros’ old design for a Dalek casing. The Dalek explained that most of their kind had been killed in the blast but a few unlucky survivors had become horribly mutated. These Daleks had been pushed further down their mutation cycle by Zolfian’s bomb, though still not quite to the point that Davros had accelerated the earlier Daleks too. The mutant Daleks had come to house themselves in Yarvelling’s war machine’s believing that it was the only thing that could protect them from the poison air. The mutant Dalek asked Zolfian and Yarvelling to construct more Dalek casings to house its mutated kin. The two men agreed for the good of their race. Unfortunately though they were able to construct more casings they soon perished from the polluted air on Skaro. Unlike the Thal scientists they had not bothered to try and find a way to survive the polluted air of Skaro. The focused all of their efforts on creating casings for the other Daleks. The first Dalek who approached Zolfian and Yarvelling had declared itself the Emperor of the Daleks and had been placed in a larger golden casing as a result. The Daleks were able to survive in their metal casings, but unfortunately many of the casings began to break down and in order to find a way to power them permanently, the emperor was forced to draw static electricity from the metal floors of the Dalek city This meant that the Daleks could not leave their city however as if they did then the machines would lose power and the creatures would die. Thus the Dalek race was seemingly confined to their city, though they were still able to live there as it had everything they needed to survive in their including machines that could produce artificial non irradiated food. The Daleks would remain trapped in their city for many centuries until they would encounter their two greatest enemies once more, the Thals and the Doctor. The Thals would later travel to the continent the Daleks where living on. Their own continent had been drained of the few resources it had left after Zolfian’s bomb and was virtually dead. Hoping that there might be some life on the other continent the Thals also hoped that there might be some Dalek survivors and that they could work with them to rebuild their planet. By this point the Thals had become complete pacifists. Despite the fact that it was the Daleks who had launched the neutron bob that had devastated Skaro the Thals still blamed themselves for the conflict. They decided to never under any circumstances fight in a war again and hoped that they could reason with the Daleks should any of them have survived. Having long since left their city the Thals took with them samples of their drug, food supplies and some historical records, most of which had become lost. The Thals had virtually no documents about the Kaleds, though they had some records of the Dals. The last group of Thals soon stumbled upon the Dalek city. Unsure of whether or not to explore it little did they know they were soon spotted by the Daleks camera’s at the edge of their city. The Daleks were absolutely horrified to see that some of their enemies had survived after believing that they had exterminated them 500 years ago. Realizing that if the Thals had survived then they must have had something that could allow them to survive outside in the poison air. The Daleks wanted whatever it was the Thals had in order to survive outside of their casings. Meanwhile in the petrified jungle of Skaro the Daleks greatest enemy, the Doctor arrived. Though this was not the first time he had arrived on Skaro, technically it would be from his point of view the first time he ever encountered the Daleks and as a result things would never be the same for the renegade time lord again. The Doctor in his first incarnation was desperate to explore this strange, seemingly dead planet despite his companions misgivings. He later tricked them into exploring the Dalek city that he had seen in the distance by claiming that a piece of his TARDIS was damaged and the only way he could repair it would be too explore the city where there might be the necessary equipment to fix it. This decision would ultimately be the worst the Doctor would make in any of his many lives. The Thals had spotted the Doctor and his companions when they were exploring the dead forest. Their leader Aloydn attempted to contact Susan the Doctor’s grand daughter, but as it was dark and she couldn’t see him properly she paniced and fled befored he could speak to her. Later just before the Doctor and co left for the city Aloydn left a box that contained the anti radiation drugs outside of the TARDIS. The Doctor unsure of what it was simply placed it in the TARDIS to examine later and headed off for the city with his companions. Whilst there Barbara became separated from the others and was kidnapped by a Dalek. Barbara comes face to face with one of Skaro’s nastiest. The Doctor, Ian and Susan meanwhile would discover a giga counter upstairs that revealed to them that the air of the planet was polluted. Realising that they had all contracted radiation poisoning due to their long exposure to it, the Doctor revealed his bluff to a furious Ian. Before the travellers could even begin to search for Barbara they were captured by a patrol of Daleks. Ian in his attempt to escape was shot by a Dalek that merely paralysed his legs as the creatures wanted to keep him and the others alive for questioning. With all 3 of them being placed in a cell alongside Barbara the Daleks would later interrogate the Doctor on his own. They initially believed him to be a Thal but the Doctor soon convinced them that he was a visitor from another world. During his conversation with his Dalek captors the Doctor came to realise that the box left outside the TARDIS was in fact a sample of the Thals anti radiation drugs. He made a deal with the Daleks that one of them would leave the city to retrieve the drugs which they would then split. Though the Daleks agreed to this they ultimately had no intentions of allowing the Doctor and his companions to keep any of the drugs. Susan being the youngest was the least affected by the radiation sickness and therefore she was sent out to retrieve the drugs from the TARDIS. On the way back she encountered Alodyn who explained to her the history of his planet. He told her that his people wished to make peace with the Daleks and rebuild Skaro. Nevertheless he didn’t entirely trust them and so he gave Susan a second supply of drugs. As soon as Susan arrived back in the city the Daleks discovered the second supply. They allowed her and her friends to use them simply because they felt that they could use them in their plans. The Daleks heard from Susan that the Thals wished to make peace with them and so they decided to use her to lure their old enemies into a trap. They got Susan to write a note which they then left on the gates of their city which said that the Thals where to come to their city the next day and collect food and water from them and that together they could then rebuild all of Skaro. That Thals desperate for peace believed them and came to the city the next day, unaware that the Daleks intended to exterminate them. The Doctor and his companions meanwhile managed to overpower the Dalek that was guarding them by figuring out their weakness that they needed to pick up power through the floors. They managed to defeat it by dragging it across a cloak that Alodyn had given to Susan which separated it from the floors. Ian later managed to warn the Thals just as they walked in the Dalek’s ambush. Unfortunately he was too late to save the Thal’s leader who was gunned down in cold blood by the Daleks. The rest of the Thals meanwhile managed to escape back into the jungle. Ian attempted to convince them to fight the Daleks but the Thals who had forsaken violence refused and instead planned to simply move back to the plateau they had stayed in briefly before moving down to the Dalek city. Ultimately however the Doctor and his companions where able to convince the Thals to fight back, though this was not just out of pure altruism. The Doctor needed the Thals help to get back the piece of TARDIS that he ironically had pretended had been damaged in order to explore the city in the first place. The Daleks had stolen it from him whilst they held him prisoner. The Doctor his companions and the Thals split up into two separate groups. The first one was led by Ian and Barbara which attacked the Dalek city from the back. The back of the city had the perfect natural defence. It was surrounded by a large lake filled with mutations. One Thal was killed was passing by it, but Ian and Barbara’s team where nevertheless able to make their way up the mountain and through a treacherous cave system into the city, though another Thal fell to his death in the process. The second team led by the Doctor attempted to attack the Daleks from the front, but the Doctor and Susan were captured in the process. In the Daleks custody Susan and the Doctor discovered that the monsters were planning to flood Skaro with radiation that would permanently pollute the air of the planet to the point where not even the Thals would be able to survive with their anti radiation drugs. The Daleks were doing this not just to destroy the Thals but also to survive too. They had tested the Thal’s anti radiation drugs on themselves and discovered that it was like poison to them. Ironically over the years the Daleks had mutated to the point where they had become dependent on radiation and in order to survive outside of their casings they needed to pollute the air with more radiation. The Doctor pleaded with them to try and find a way to co exist with the Thals but the Daleks stated that the only interest they had in the Thals was their extermination. The Doctor even offered them the secrets of the TARDIS at one point in exchange for the Thals lives, but the Daleks still prepared to flood the planet with the radiation. Fortunately Ian and Barbara’s group of Thals having made their way into the city attacked the Daleks. Though the Daleks had the upper hand in the fight, Ian and Barbara’s group managed to distract them long enough for the rest of the Thals led by Alodyn to attack the front of the city. The Daleks were overwhelmed having not expected the Thals to strike back, and the Thals managed to knock out their main power source, whilst the Doctor prevented their reactor from unleashing the radiation on the planet..
All of the Daleks began to lose power to their machines one by one. The last Dalek to lose power begged the Doctor to help, but the Doctor stated coldly that he didn’t know how. The Daleks were seemingly dead. Though the Thals wished there had been another way, the Doctor told them that they had had no choice and left them to rebuild their world. During his time with the Thals the Doctor had looked at their few surviving historical record. Seeing portraits of the Dals, the Doctor incorrectly believed that the Dals were the forebears of the Daleks. The name Dalek did in fact come from the Dal language, but ultimately the Dals in actual fact had nothing to do with the Daleks as the Doctor would later discover when he visited their past and saw their true ancestors the Kaleds. The Thals meanwhile began to utilise some of the Dalek technology in order to produce artificial food. They moved into the city and placed the Dalek casings to the bottom layer of the city. Little did they know the Daleks were not dead after all. They had been merely placed into a state of suspended animation. Once again the creatures had been wrong about their own nature. They had mutated to the point where they weren’t even sure what they actually were any more. They could survive outside of their casings, albeit not for long without going into a comatose state. The Emperor of the Daleks meanwhile deep below in the bottom layer of the city of Skaro had not been affected by the power drain. He had a special back up source that would allow him to exist long past the others. The Emperor’s compartment had been sealed off from everyone else. The Emperor had done this for extra protection just in case the city had ever been breached. From the very beginning he had taken into account the fact that there might have been more Thals alive on Skaro. Neither the Thals or the Doctor had been aware of the Emperor’s existence and thus whilst the Thals where moving into the city and using its technology and resources little did they know the Emperor of the Daleks was scheming against them. The Emperor was able to monitor the Thals from his secret base and waited for the right moment to strike. Late one night when the Thals were sleeping the Emperor managed to sneak his way through the city and reconnect the city’s main power source to all of the Daleks below. These Daleks then emerged and began to slaughter the Thals in their sleep. They killed the most of them, but managed to keep a few others alive. Despite their earlier wish to exterminate them the Emperor now believed that they needed the Thals help to survive. Their main power source had been damaged by the Thals and indeed if they were to try and flood the planet with more radiation then they would completely drain their power source. Thus the Emperor instead decided to spare some of the Thals in order to use them as slave labour to try and find a way to improve their casings so that they could survive outside of the city. With the Thals as a labour force the Daleks were able to make some improvements on their design like never before, as they had never had the slave labour to use before. The Emperor was able to invent a new device that could be fitted to the Dalek’s backs that could allow them to move outside as it allowed them to pick up power from the city. However even with this the creatures could still only move on flat ground. They needed hover devices that could allow them to fly over rough terrain. A few of the Thals managed to escape from the Dalek city, though most of them were hunted down by the Daleks, a few managed to evade them and were eventually able to build a new base underground away from the Daleks. The Daleks meanwhile were able to construct transolar discs that could allow them to fly high above the ground. The biggest flaw in the Dalek design is fixed. With all of the problems in their casings fixed the Emperor decided not to flood Skaro with radiation as he believed that they were stronger in this form. If they were to leave their casings they would be weak, amorphous blob like creatures that would be vulnerable to their enemies. In their casings they were strong, powerful and able to defend themselves easily. The surviving Thals that they had prisoner were all exterminated. The Daleks still needed slave labour but they felt that the Thals were too dangerous as they knew the Daleks inner most secrets. The Emperor unaware that a few Thals had managed to escape underground believed that the entire Thal race had at last been exterminated. Just as the Thals had underestimated the Daleks then the Daleks had now underestimated the Thals. The Thals would wait underground. They were not, not striking out against the Daleks out of pacifism, but simply because they knew that they were in no position to threaten them. Thus they bided their time waiting for the right moment to fight back against the Daleks. For now at least the Daleks were finally the masters of Skaro. With a new army to command the Emperor made preparations to begin the Dalek war against the rest of the universe hoping to enslave other life forms and use them to help them construct their casings just like they had done to the Thals. The Daleks are ready to take on the universe. Skaro would be visited by a race of aliens called the Krattorians. The Krattorians were a race of slave traders and they arrived on the planet with a group of slave workers. The Daleks eager to capture the secret of space travel from them concealed their city underneath the sand by magnetizing the sand which pulled it over the city creating a dune. Two of the slaves named Astolith and Sala planned to overthrow the Krattorians. Unfortunately the two were betrayed by Sala’s uncle Andor. Whilst Astolith was captured by the Krattorians, Sala managed to escape, but was soon found by the Daleks. The Emperor pretended to care about Sala’s people, but what he really wanted to do was set the slaves and the Krattorians against one another. When Sala returned she offered to take Kest the leader of the Krattorians to the Daleks. This of course had been a plan of the Emperor who ambushed and killed the Krattorians and managed to steal and study their ship. Kest agreed to help the Daleks learn how to fly it as long they hunted down Sala and Astolith. Unfortunately the Daleks were unable to find them and Sala and Astolith managed to find their way to the ship with the remaining slaves and used it to escape Skaro. Kest and Andor were subsequently exterminated by the Daleks. Though the Daleks had lost the ship they had nevertheless learned the secret of space travel from the Krattorians and it wouldn’t be long before they built their own spaceships. The Krattorians space vehicles were saucer shaped and thus the Daleks which were modelled on them would be saucer shaped too. As the Daleks began to prepare their space fleet to begin their war against the rest of the galaxy there was already descent in the Dalek ranks. Dalek Zeg was a lowly Dalek scientist who had become mutated in a lab accident and became virtually indestructable as a result. Zeg soon challenged the Emperor himself for control of the Daleks. The Emperor faced him in a duel. Zeg proved to be resistant to many different types of attack from the emperor but ultimately he managed to beat him first by tricking him with a decoy and then tricking him into firing a liquid air tank which finally destroyed Zeg with extreme cold. Though Zeg had been a traitor his final experiment had actually been a success as the new substance he developed called “Metalert” would make the Dalek casings stronger and allow them to travel through deep space. Not long afterwards the Daleks prepared their first invasion fleet and soon launched an attack on the planet Alvega. Alvega was inhabited by intelligent plant creatures called Amarylls. They put up a good fight but were no match for the Daleks. 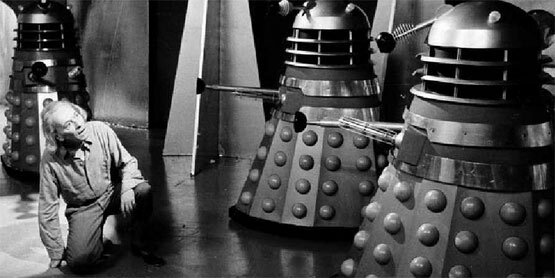 Whilst they were never able to drive the Daleks off the Amarylls kept battling them refusing to bow to their will. Unfortunately this turned out badly for them as the Daleks eventually decided that the planet was not worth the trouble and destroyed it completely, utterly wiping out the Amarylls. The next planet the Daleks came to was Solturis. This planet would have better luck against the Daleks. The Daleks attempted to trick its inhabitants into giving them a superweapon they had developed called the Penetray which they ultimately used on the Daleks themselves destroying their invasion fleet. Following this humiliating defeat the Daleks would have to deal with a major threat on their home planet. A radiation cloud which that had been created in an accident had a devastating effect on Dalek casings and threatened to exterminate the entire Dalek race. After dealing with the cloud the Daleks soon faced a new enemy when Skaro itself was ironically invaded by a hostile race of aliens, the Monstrons. The Monstrons wished to enslave the Daleks and were far more advanced than the Daleks at that point too. Indeed they were arguably the first enemies to completely humble the pepper pots as they managed to destroy the Emperor’s secret chamber and even drive the monsters from their city. Still despite this the Daleks nevertheless managed to destroy them when a lone Dalek soldier sacrificed itself by triggering a volcanic eruption which destroyed the Monstron’s spaceship. The Daleks drive the Monstrons from Skaro. Following this the Daleks would soon come into contact with another enemy who was more than a match for them. The Mechanoids. The Daleks first came upon the Mechanoids when they managed to take control of a single Daleks mind on board a space station the Daleks were building above Skaro. The Mechanoids forced this Dalek to turn on its own kind. It managed to exterminate several Daleks before being restrained. Unfortunately for the Mechanoids who were controlling it, they were soon discovered by the Daleks. Their ship had previously been concealed within a cloud. The Daleks quickly exterminated all of them, but the Mechanoids would retaliate and melted the Dalek saucer. Both races after this clash declared war upon each other. 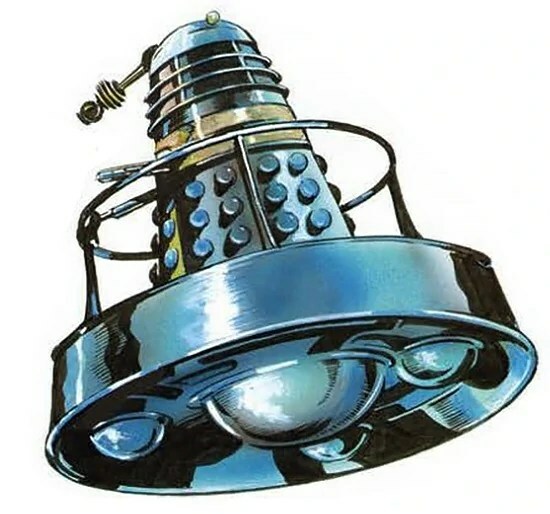 A Mechanoid, one of the Daleks major enemies. The Daleks would conquer the hidden planet Phryne in an effort to aid their war against the Mechanoids. The Daleks wished to use the planets invisibility technology in their war against the Mechanoids but The Controller of Phryne committed suicide rather than let the technology fall into the Dalek hands. Thus whilst the Daleks did conquer the planet they ultimately did not get what they wanted from it’s people. The Daleks nevertheless would be able to divert the rogue planet Skardal towards the home planet of the Mechanoids, hoping that the collision would destroy both planets. With both races now ready for a full scale war across the entire galaxy, the Daleks and the Mechanoid’s activities had been monitored by the inhabitants of the planet Zeros. Terrified at the destruction that would result in a full scale war between the Daleks and the Mechanoids, they sent a robot called 2K to the planet Skaro who was not only able to prevent Skardal from crashing into the Mechanoid’s home planet but was also able to successfully trick both the Daleks and the Mechanoids into calling an impasse, stalling the war for now. After having successfully found a way to move Skardal the Daleks soon began to work on a way to try and move their own planet. Believing that if they could do this they could turn it into a gigantic spaceship. The Daleks would next battle a threat from their own planet the Terrorkon. The Terrorkon was a gigantic mutant that lived within the lake of mutations. Having turned on even the Daleks themselves the creature proved problematic for the Daleks underwater defences and so they were forced to exterminate them completely. Not long after this, the Daleks would soon free by accident three humanoid Daleks, Lodian, Zet and Yvric. These Daleks were not Kaleds but rather blue skinned humanoid Daleks. Lodian became convinced that the metal Daleks were evil and sought to destroy them whilst Yvric believed that they would appoint them the leader of their race. Ultimately however as soon as he arrived at their base the Daleks killed him. Lodian and Zet meanwhile prior to being frozen had discovered the location of a planet named earth. Zet was all for telling the Daleks about the location of the earth in exchange for his own life, but Lodian ultimately sacrificed himself and murdered Zet in the process in order to prevent the Daleks from finding out about the planet. The Emperor would soon have to deal with a renegade member of his own kind who soon began to embrace his human side. These Daleks remember had not been conditioned to be truly evil creatures like Davros’ Daleks. Instead they had simply adopted that as their way of life, and as a result this Dalek embraced its more compassionate side. It even began to decorate itself with flowers! Terrified that this could lead to a rebellion among the rest of the Daleks the Emperor was quick to crush the rebellious Dalek, but rather than simply exterminate him he wished to prove to him and the other Daleks how beauty does not last by showing to him how the flowers he admired had already begun to decay. The Daleks would later come into conflict with humanity when a human spaceship called the Guardian accidently strayed too close to Skaro. The Guardian had hoped to destroy gigantic mutated plants on the planet Arides in order to prevent their seeds from spreading across space. It was the 22nd century and mankind had already spread out across the stars and established colonies on other planets. Though they had not built up an empire like they later would they nevertheless were still a highly advanced race. 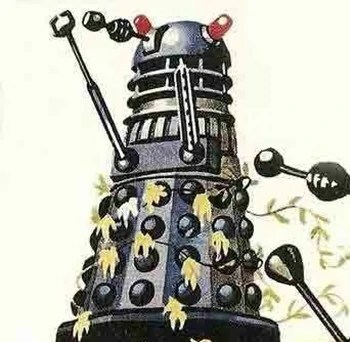 The Daleks managed to capture the Guardian and planned to exterminate the ships crew, however their leader Kirid was able to trick the Emperor by convincing him that the seeds would be dangerous to the Daleks as well. When the emperor found out that he had been tricked he ordered the humans who have managed to escape’s extermination. Though the Guardian was able to complete its mission and save countless worlds from the Arides plants unfortunately their ship was destroyed by the Daleks. The Emperor soon began to worry about humanity having observed from Kirid how cunning and how brave they were. Kirid could have simply fled but instead stayed behind to finish the job at the cost of his own life. The Emperor would very soon come into conflict with humanity once again when the spaceship Starmaker crashed landed on Skaro. The Emperor managed to capture two of the ships crew, two small children Tom and Jennie. 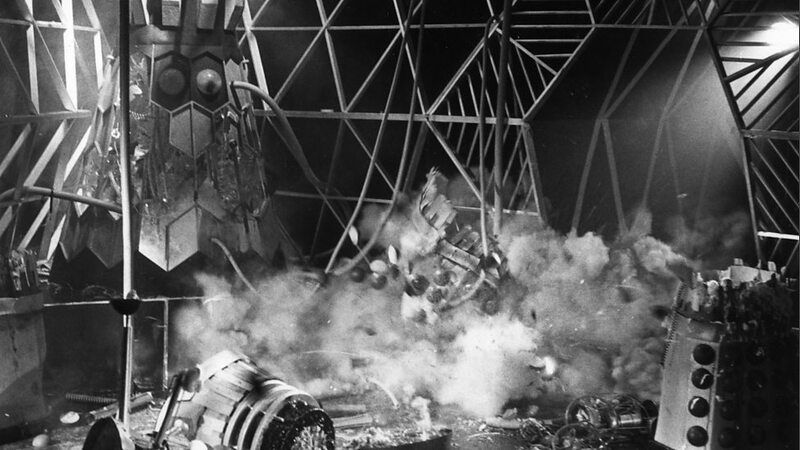 Though they were rescued by Captain Fleet, the rest of the crew and the ship itself were all destroyed by the Daleks. Fleet and the two children managed to escape Skaro and make their way back to earth. Unfortunately the damage had been done as the Daleks had already discovered from the starships remains where the planet earth was and the Emperor soon set his sights on it. Fleet managed to make his way back to earth where he warned humanity of the Daleks. The Daleks meanwhile had managed to remove the magnetic core of their own planet and replace it with a giant motor. This had been the culmination of their experiments to try and move the planet following their successful attempt at moving Skardal. The Daleks flew Skaro itself into our solar system. There they launched attacks on all of our off world colonies. They managed to conquer Jupiter, Mars, Saturn and Venus. Unfortunately for them two humans Jeff and Andy whilst searching for their sister were able to start a rebellion on Venus, managing to successfully to destroy their oil well. Jeff would also later be part of a human mission to infiltrate Skaro where he was able to learn many of the Daleks deepest secrets. At some point Jeff and Andy managed to rescue Mary from the Daleks clutches and together the three of them would continue to battle the monsters for a long while. 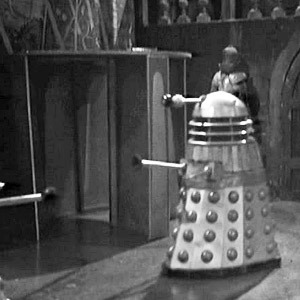 The Daleks would in turn attempt to lure them into traps on both Mars where they attempted to have them killed by android servants and the planet Gurnian where they attempted to feed them to the two headed Horrorkons. Unfortunately for the Daleks this backfired as the Horrokons only fed on metal and thus the Stones were able to turn them on the Daleks themselves. Eventually there where rebellions on planets like Mars, Venus and Jupiter and humanity began to push the Daleks back. Jeff, Andy and Mary Stone, the Daleks primary enemies during the early years of their war with humanity. The Emperor seemingly admitted defeat and agreed to sign a peace treaty with humanity. Still suspecting that the Daleks wouldn’t give up that easily Mary, Andy and Jeff soon discovered that the Daleks had a secret base on the moon where they planned to detonate several atom bombs which would have torn the entire moon apart and thus devastated the entire earth. Fortunately the Stone’s were able to foil their plan and destroy the Dalek task force on the moon. Sadly however just as Mary predicted their war with the Daleks was not over yet. The Emperor was able to create a plague using captured humans as test subjects. He soon launched it at the earth hidden within small meteorites. The plague spread across the earth and began to kill millions of people. Whilst all of the earth’s scientists scrambled to try and find a cure, earth was soon cut off from its outer colonies in order to prevent the infection from spreading. Unfortunately the infection had already spread to many of the outer colonies and they too soon perished. Others that were isolated were soon attacked by the Daleks who completely and utterly blitzed them, killing all of the humans on them. The scientists on earth where eventually able to find a cure, but unfortunately by that point billions of people including the Stone family had died. With the earth now alone and weak the Daleks launched an all out attack on the planet. They bombarded the major cities with missiles and completely destroyed all of them. New York in particular was reduced to nothing but a smoking crater. The Daleks flew over the planet in their transolar discs exterminating people en masse. It didn’t matter if they fought back or not the Daleks still gunned them down in cold blood. Most of humanity was exterminated and the few unlucky survivors were rounded up in camps around the world. There the Daleks would brutalize them, torture them and experiment on them. Mankind was completely crushed. The earth now belonged to the Daleks. In the year 2164 the Daleks were the undisputed rulers of the earth. Mankind had been driven to near extinction and the few unlucky survivors were kept in Dalek death camps suffering unimaginable pain and torture. The Daleks had continued to experiment on their human prisoners in all kinds of gruesome ways, but their most successful was the Roboman experiment. The Daleks cut pieces of their human slaves brains out and replaced them with metal objects. These allowed them to control the humans bodies. Unfortunately the humans were still completely aware, trapped in their own bodies struggling to get control of them, eventually the hardware in their brains caused the robomen to break down destroying their minds. When the Robomen reached this state they would kill themselves. The Robomen only lasted a few weeks each, nevertheless they would prove vital to the Daleks in helping them maintain their rule of the earth as they acted as expendable foot soldiers. In spite of this a few human beings did manage to escape the death camps and form tiny little pockets of resistance around the world. Ultimately however these resistance groups were completely ineffective. Unlike the Thals the human beings had no knowledge of the Dalek’s weaknesses and were easily crushed by them. Also many of the rebels where scattered across the earth and had no way of contacting one another. The rebels also not only had to content with Daleks and Robomen patrolling the streets, but also wild animals including crocodile’s and rabid dogs that had been let loose after the Dalek invasion. These animals were no threat to them as their jaws could not dent the Dalek’s armour, but they could easily pick off stray humans and often would in the dark. In addition to this the Daleks also unleashed several mutants from their own planet Skaro on the earth. Again these creatures who were flesh eaters had no interest in the Daleks so they instead feasted on human beings. The worst was the Slither the pet of the Black Dalek the commandant of the main Dalek death camp. Several unfortunate souls in the camps would actually be fed by the Daleks to the creature which would eat them alive. As a result of this many people chose to serve the Daleks willingly in the hopes of getting better treatment from them, whilst others generally tended to only serve themselves and kept a low profile. Still the resistance movements did persist, but one by one the Daleks were able to crush them until only a very few remained. Our future is to be dominated by the most evil creatures in the universe. The Daleks would make use of the resources on the planet earth including humanity to construct new and powerful weapons with which they used to wage war against hundreds of other planets across the Galaxy. They soon built up a massive empire and became arguably the dominant power base within the mutters spiral. They managed to drive out their old rivals the Mechanoids who vowed to get back at them. The monster had become a true force to be reckoned with and the turning point had been the fall of earth as it had the necessary resources they needed, more so than other planets they had conquered such as Phryne (whose people they had since utterly exterminated) or even their own planet Skaro. The Daleks wished to transform earth into a spaceship just like they had done to their own planet and soon made plans to remove its magnetic core and replace it with a giant motor that would allow them to pilot the planet anywhere across the universe. This operation was to be carried out in England where the Daleks main base of operations was. The Daleks ruled over the earth for over 20 years. “They dare to tamper with the forces of creation” “They dare and we have got to dare to stop them” The Doctor aids humanity in its darkest hour. 20 or so years after the Dalek invasion the Tardis would take the Doctor and his three companions Susan, Ian and Barbara to the earth. With the Doctor having hoped to take Ian and Barbara back to their own time in 1960’s London, its soon became apparent that they where in a very different era. Barbara and Susan were taken in by the rebels, whilst the Doctor and Ian were captured by the Daleks. From the Doctors point of view this was his second meeting with the Daleks. He was shocked to see they had survived and deduced that these Daleks where from an earlier point in history than the ones he had met on Skaro. He was of course wrong just as he had been about the Daleks ancestors being the Dals. The last tiny pocket of resistance was led by a man named Dortmun. Dortmun had constructed what he believed was a weapon that could shatter the casing of the Daleks. Unfortunately as the rebels found out during an attack on the Dalek saucer the weaponry was still ineffective. Most of the rebels were exterminated in the attack, but a few managed to escape and indeed they were able to rescue the Doctor who was very nearly robotized by the Daleks. Ian meanwhile managed to escape robotization and stowed away on board the Dalek saucer and was able to make his way to the Dalek death camp. Barbara meanwhile along with another young earth woman named Jenny fled throughout the ruins of London taking Dortmun who was crippled with them. Feeling he was holding them back Dortmun ended up sacrificing himself to the Daleks who gunned him down in cold blood. He also tried one last time to create a successful weapon against them which was a failure. Barbara and Jenny would soon be betrayed by two Dalek collaborators and taken to the death camps. There however they were able to trick the Daleks by claiming that they had proof of plans of a rebellion against the Daleks using Dortmun’s old plans as proof. Barbara was taken to meet the black Dalek. Whilst there Barbara discovered the Dalek’s weakness. They controlled the Robomen through a single speaker. Barbara hoped that if she could get hold of it she could give it new orders to turn on and attack the Daleks. Unfortunately her attempt to do so was a failure, and the Daleks restrained her and Jenny. Leaving them both to die in their base the creatures were preparing the final part of their plan to drop a bomb into the earth’s core which would destroy it after which they could then place a giant motor in its place. The Daleks left Barbara and Jenny to be killed in the explosion. Unfortunately for the Daleks the Doctor leading a group of human rebels was able to make his way into the Daleks base where he was able to disconnect their main power source which shut down their casing leaving them immobilized. He also freed Barbara and following her idea gave the Robomen new orders to turn on kill the Daleks all over the world the Robomen turned on the Daleks who thanks to the Doctor were now powerless to fight back and were slaughtered by their own servants as well as the human slaves who joined in. Ian meanwhile having made his way past the Slither, which he was able to kill by luring down a mine shaft was able to defeat the Daleks by trapping their bomb further up the mine shaft than they intended. When it went off it caused a volcanic eruption that consumed the Dalek base and their main fleet. Whilst the human slaves were able to escape in time the Dalek who were immobilized were destroyed. With the rest of the Daleks being killed by their own robomen around the world the earth was freed from their rule at long last and mankind could begin to rebuild their shattered world. The only Dalek who managed to escape the earth was the black Dalek who had a back up power source. After returning to Skaro he gave a full report of why it had failed including an account of a possible alien influence who knew their weaknesses. Unfortunately for the Daleks they did not have the time to waste in trying to reclaim the earth. The Mechanoids who had fled to another galaxy had since rebuilt their forces to become stronger than ever again. Launching several counter assaults against the Daleks the Daleks were forced to pull all of their resources into battling their old enemy. Mankind meanwhile was able to rebuild and within a hundred years humanity would be strong again. The Daleks encounter one of many, many old enemies. 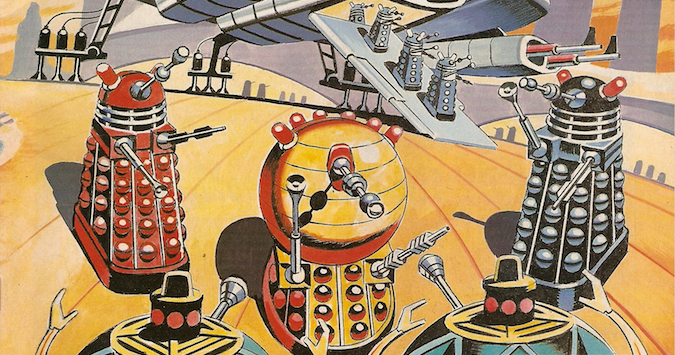 The Daleks battled with the Mechanoids over the entire galaxy. Though the Mechanoids were utterly ruthless creatures, many races still sided with them over the Daleks. In addition to this as news of humanity’s triumph over the Daleks spread throughout the galaxy it soon inspired similar rebellions on other planets most of which were crushed, but some nevertheless were still successful and gradually as time went on the Dalek empire began to crumble. Eventually mankind would after having recovered join in the war against the Daleks too. Unable to take the force of so much opposition the Daleks where forced back to their home planet Skaro which they soon flew through space to escape their enemies. The Mechanoid meanwhile had exhausted all of their supplies so much that they were unable to begin conquering other worlds either. Though they were able to reclaim their home planet, they were mere shadows of their former selves. The Daleks whilst piloting their planet made plans for a counter attack against their enemies, but unfortunately for them their greatest adversaries after the Doctor, the Thals were finally ready to strike back at them. That Thals had spent the last several decades hiding under the ground. Unknown to the Daleks who had believed they had exterminated them they had managed to build a thriving civilisation under the ground. The Thals though still worshipping peace above all else knew that they had to stop the Daleks, but up until now there had never been a good enough moment to strike. With the creatures now at their weakest the thals managed to catch the Daleks unaware’s. Striking at their main power source in their city which they still used after all of these years, they managed to shut the Daleks down once more. With the Daleks out of action the Thals returned to the surface. The Daleks are put out of action a second time by the Thals. The planet Skaro would eventually be discovered to where it had been moved to by humanity. The human race soon quarrantined the planet making it a crime for anyone to go there and for 50 years no one would save Jonathan Ladiver who made contact with the Thals and entered into a relationship with and eventually married a Thal woman named Ijayna. Unfortunately he would be arrested for breaking intergalactic law. Despite this he would end up visiting Skaro again very soon under less than pleasant circumstances. The spaceship starfinder that was supposed to take Ladiver to earth to stand trial was blown off course by an asteroid shower. Forced to make an emergency landing on Skaro and within the Dalek city itself. Not long after the humans arrived the deactivated Daleks were mysteriously re awoken. Ladiver was accused of being the traitor who had forced them to land on Skaro so that he could reactivate the Daleks by Redaway the ships captain. Ladiver denied this of course and though Redaway did not believe him the team were forced to work together as the Daleks began to pick them off one by one. Redaway himself was soon captured by the Daleks who brutally tortured him to death. Redaway has some not nice encounters with the locals. Redaway was able to discover during the torture who the real traitor was, but unfortunately after he escaped he died of his wounds before he could tell Ladiver, though he did still nevertheless apologise to Ladiver with his dying breath for having misjudged him. The traitor was later revealed to be Bob Slater a member of the crew. He had reactivated them with devices that he had placed on their backs. If the Daleks disobeyed him he could deactivate them and thus render the Daleks powerless once again. Slater had hoped to use the Daleks to conquer the galaxy but unfortunately for him the Daleks whilst pretending to be his docile servants managed to find a way to reactivate their main power source. Slater watched in terror as the devices dropped from the Daleks backs. Realising his hold over them had gone, he tried to flee only to be gunned down by the black Dalek. After killing Slater, the Daleks are in control once again. The Black Dalek soon made plans to resume their war against the rest of the galaxy. Unfortunately for the Daleks the Thals however would manage to stop them yet again. Ladiver managed to escape from the city and contact the Thals. It was his own lover Ijayna who managed to defeat the Daleks by reconnecting the main power cable that had been modified so that it drained the Daleks of their power. Just before the black Dalek was rendered comatose once again he swore to Ladiver that the Daleks would one day return. Ladiver would spent the rest of his life on Skaro with Ijayna. Many more decades would pass during which there was peace on Skaro for the first time in centuries. Unfortunately that would end when the Moroks invaded and conquered the planet. The Moroks had been a race of pitiless conquerors no better than the Daleks. They had emerged recently as a new galactic power. The Thals put up a good fight against the invaders, but ultimately the Moroks were simply too powerful for them and in a relatively short time the Thals were conquered. Earth no longer cared for Skaro. Though the planet was still in quarantine they did not wish to waste time and resources protecting it when it became apparent that the Moroks had no interest in reactivating the Daleks and thus they rather callously left the Thals to be conquered. A few Thals out of desperation reactivated the Daleks who had simply been left in their city once more. The Thals had not killed them as they did not want to be guilty of genocide so they had simply left them and guarded them to make sure the power could never be restored. The Daleks agreed to form an alliance with the Thals as they soon realized that they had no choice due to the Moroks being a bigger threat. Thus the Daleks and the Thals incredibly would actually work together to take on this common enemy. The Dalek city became their base of operations and the Daleks at first were able to allow the Thals to strike back at the Moroks. Unfortunately even the Daleks were no match for the Moroks either. Their weaponry could blow open Dalek casings and they bombarded the city regularly too. 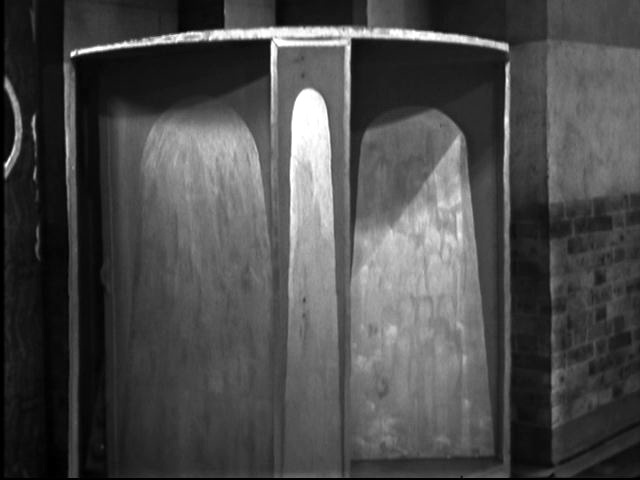 One dead Dalek casing was taken to the Morok’s museum and placed in their hall of conquests as a sign of their triumph over the Daleks. Ironically just as they were on the brink on of conquering the Daleks the Moroks would end their chances at ruling Skaro themselves. The Moroks had detected life signs deep beneath the surface of Skaro. Desperate to find out what it was, they soon tunnelled deep beneath the earth to where the old Kaled Bunker had been. The Moroks get a very nasty surprise when they explore the ruins of the Kaled Bunker. Davros’ Daleks had remained trapped under the rubble for hundreds of years. Though they had managed to tunnel through parts of the rubble unfortunately they lacked the proper resources to free themselves, though they probably would have been able to eventually. Ultimately it was the Moroks who managed to break through the rubble and freed the Daleks from their imprisonment. Davros’ Daleks were far more powerful than Zolfian and Yarvelling’s Daleks. Even with the advancements Zolfian and Yarvelling’s Daleks had made, Davros’ Daleks were still much more dangerous. Davros had been a genius centuries ahead of his time. His Daleks had a virtually limitless power source that was contained within each individual Dalek meaning they were not dependent on a single power source like Zolfian and Yarvellings. The metal Davros had used for them was far stronger too. The Morok’s weaponry simply bounced off of their casings. They also had a hover pad built into the bottom of their casings. This was far more efficient than the Transolar Discs Zolfian and Yarvelling’s Daleks used. The transolar discs were quite slow moving and could easily be shot out of the sky by the Moroks. The hover pad however enabled the Daleks to move at rapid speeds throughout the sky and it was built into them too. Finally Davros’ Daleks fire power was far more powerful too. Davros’ Dalek slaughtered the Moroks who had ventured into the bunker effortlessly and quickly left their bunker and began to attack the alien invaders across all of Skaro. The Moroks were not even able to inflict one casualty on Davros’ Dalek force who ruthlessly dispatched them and sent them fleeing from Skaro. Davros’ Daleks had saved their home planet. Unfortunately they soon turned their attention towards the Thals and Zolfian and Yarvelling’s Daleks. Davros’ Daleks viewed Zolfian and Yarvelling’s Daleks as inferior for many reasons. Not only were their casings weaker, but they were earlier in the Kaled mutation cycle and most importantly their minds had not been conditioned either. Though ruthless and xenophobic they still had traces of other emotions and feelings and even their own separate identities and names such as Dalek Zeg. Davros’ Daleks viewed these as being aspects of lesser creatures and demanded that they allow themselves to be both mutated and reconditioned mentally to be like them. At first Zolfian and Yarvelling’s Daleks refused and even sided with the Thals to try and destroy these new Daleks, but ultimately when it became apparent just how powerful they were, Zolfian and Yarvelling’s Daleks surrendered. Most of the Thals were exterminated though once again a few managed to take cover deep underground though they were forced to flee even deeper this time. All of Zolfian and Yarvelling’s Daleks would be further mutated to the point were physically they were identical to Davros’s Daleks, their minds were also purged of all emotions except hate like Davros’s Daleks and all traces of their identities were wiped too. Their casings were also improved too. Now there was only one unified Dalek race. The Emperor and the leader of Davros’s Daleks who had personally gunned down Davros agreed to merge together into the one creature which was considerably more intelligent than any other Dalek and now required a much larger casing. With Skaro once again theirs, the new an improved Dalek race piloted Skaro out of the galaxy and into a solar system of uninhabitated planets so that they could begin plans to resume their war against the rest of the cosmos in peace. “Daleks cannot be defeated”. The Daleks follow their greatest enemy through all of time and space itself. Davros’ Daleks had been aware of the Doctors existence from the very beginning. Though the Doctor had been able to destroy the tape Davros had forced the Doctor to make, explaining the reason for every Dalek defeat, pieces of old CCTV footage of the Doctor debating with his companions on whether or not to destroy them had survived. In addition to this before his death Davros had managed to program into them knowledge of the Doctor too. Though again he did not manage to program into their minds the reason for every Dalek defeat, he nevertheless gave them vital knowledge of their most dangerous adversary. After taking over Zolfian and Yarvelling’s Daleks they soon noticed that the Doctor had been present at two very important events in their history. There had been accounts as well as footage of an alien being who called himself the Doctor when the Thals had managed to defeat the Daleks and the black Daleks account of their defeat on earth also mentioned a possible alien intelligence that sabotaged their power system, as no human being would have had that knowledge. Once again surviving CCTV footage also showed exactly the same figure who had been on Skaro many years earlier in the Dalek base. Thus the Dalek Emperor decided that the Doctor must be found and exterminated. He was clearly their most dangerous enemy who knew things about them that even they themselves did not. The Emperor ordered that all priorities were to be placed on finding the Doctor. Their war against other life forms such as humanity could only resume after the Doctor was eliminated. In order to find their greatest enemy the Daleks would need to discover time travel and thus for the next few decades all of their resources were put into this. Many of their early time travel experiments were dismal failures and the time capsule’s were lost. Eventually however the Daleks were able to build a working time capsule which was christened the “DARDIS.” This capsule could travel anywhere to any planet at any point in its history just like the Doctors. The Daleks did not wish to use it to alter their own history. Scared that doing so might end up damaging their own timeline in ways they couldn’t imagine. For instance if Davros’ Daleks altered the events of the Dalek Invasion of earth they may very well have changed history so that they were never freed from the bunker. The Daleks were able to track the Doctor as through their own experiments they learned that time travel creates a form of damage in the vortex itself, a small rip and thus by simply tracking similar tears through the vortex they could locate another time vessel. A squad of scientist Daleks were dispatched to locate the Doctor throughout all of time and space. A new Dalek ranking system had been established with the Emperor at the top, the black Daleks next in line, the silver Daleks meanwhile acted as the scientists whilst the grey Daleks were the warriors. Thus a group of silver Daleks were dispatched to track the Doctor down and kill him. The Daleks time machine, the DARDIS. Like the TARDIS it was bigger on the inside than the outside. The Daleks pursued the Doctor across many different planets and time zones. The first planet they both landed on was the desert world Aridus. Aridus had once been an ocean planet, but when its two suns moved closer together then its oceans dried up, killing most life on the planet except for the peaceful fish like Aridians and the flesh eating Mire beasts. The Daleks enslaved the Aridians threatening to exterminate their population unless they aided them in finding the Doctor and his companions. Fortunately the Doctor and co managed to give them the slip and make their way back to the TARDIS. 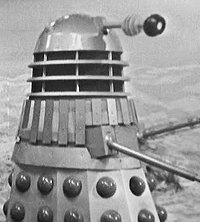 The Daleks followed them through time first to 1960’s Manhattan and then to the Mary Celeste where it was revealed that the Daleks had been responsible for the famous mystery surrounding the boat as their appearance terrified the ships crew and caused the crew to flew into the oceans waters. The Daleks next followed the Doctor to a haunted house! In truth however the haunted house was merely a fun fair attraction far in earth’s future. The robots of famous monsters had been damaged and soon began to attack the guest hence why it had been shut down. Unfortunately for the Daleks travelling in the vortex had affected their weaponry so that it was low on power. Thus their weapons were completely useless against these mechanical replica’s who soon began to attack them whilst the Doctor and his companions were able to slip away quietly. The Daleks would next follow him to the home planet of their sworn enemies the Mechanoids. Here the Daleks actually managed to create an android replica of the Doctor which they used to try and infiltrate and kill his party. The robot ultimately failed however as it referred to the Vicki the Doctors earlier companion as Susan. Susan had stopped travelling with the Doctor by this point but the last time the Doctor had encountered the Daleks she had been his companion. Though the Doctor managed to dispose of the robot the Daleks managed to corner him and his companions in a small cave. With their being seemingly no escape, the Doctor, Ian, Barbara and Vicki were saved at the last minute by a Mechanoid. The Mechanoids initially believed that the Daleks had arrived here for them, however they were soon surprised to see that the monster were pursuing these humanoid creatures and thus they captured them in order to find out why. The Mechanoids also had a human prisoner Steven Taylor. Steven’s spaceship had crashed landed on Mechanus and the Mechanoid’s after capturing him tampered with his memory. They made him believe that they were harmless robots that had been built by humanity to help them colonize other worlds. In truth the Mechanoids were ruthless robots created from a far away galaxy, but they made him believe that they were simply harmless robots so that they could observe his behaviour. The Mechanoids having slowly begun to rebuild their forces wished to conquer earth, but in order to do that they would first need to learn about human beings and thus they studied and even experimented on Steven (wiping his memory of the experimentations) to learn about their weaknesses and strengths. The Daleks soon followed the Doctor and his companions into the city. They didn’t care about the Mechanoids any more with their main target instead being the Doctor. The Mechanoids not wanting to lose their valuable prisoners attacked the Daleks and a fight soon broke out between them. Though the Mechanoids were more numerous these Daleks were far more powerful than the previous Daleks they had fought. The Daleks had managed to fix their weapons after their visit to the “haunted house” and were now at full power. In order to destroy their archenemies the Daleks battle their other archenemies. Whilst the Daleks and the Mechanoids clashed the Doctor and his companions fled the city along with Steven, though the Doctor also left a powerful bomb, stolen ironically from the Morok’s space museum which destroyed the city eliminating both the Daleks and the Mechanoids. Both the Daleks and the Mechanoids are consumed in the flames as the Doctor destroys their city. This was a huge setback for the Mechanoids as their main base of operations had been destroyed. Thus their plans for conquest had to be put on hold for now. The Doctor would use the Daleks time machine to get his two companions Ian and Barbara back home to 1960’s London where they destroyed the creatures time machine. Thus not only had the Daleks attempt to kill the Doctor been a dismal failure but they had lost their only working time capsule too. Back home Ian and Barbara were sadly unable to return to their old jobs having been away for 2 years. They soon discovered much to their surprise that some people in 1960’s knew about the Daleks. Whilst they had been away Terry Nation had discovered the very first Dalek chronicles and there had been a mild sensation about the monsters. 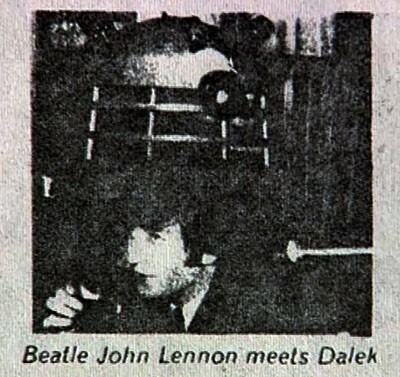 At one point even the Beatles got in on their popularity when John Lennon posed with a recreation of a Dalek. An example of the growing popularity of the Daleks in 60’s. Nation and Whitaker however at that point had only translated the Chronicles which told of the creation of Zolfian and Yarvelling’s Daleks and their early exploits just before they found the earth. Ian and Barbara contacted Nation and informed him of what they knew about the Daleks and soon came to search for other Dalek Chronicles. Soon a film company approached them wanting to cash in on the popularity of the Daleks. Ian, Barbara and Nation would serve as advisors to the two films titled “Doctor Who and the Daleks”, “Daleks Invasion Earth 2150AD”. Sadly the films producers made huge deviations from Ian and Barbara’s accounts and portrayed the Doctor as merely an eccentric human scientist named Doctor Who. The first film was a very mild success, but the second film was a huge flop. The Dalek craze had begun to die down and eventually within time the study of the Dalek chronicles faded into obscurity once more until the stealing of the earth a good 40 years later. Ian and Barbara themselves would move on and get jobs as teachers once more, but their work still proved pivotal in the early study of the Dalek Chronicles. The only films to be based on events that haven’t happened yet. There was actually a third Dalek film made titled “Daleks vs Mechons” sadly however all copies of this film were lost in a fire at the studio. All that survives is the film’s trailer. It is believed that one copy of this film may survive in UNIT’s black archive, but this has never been verified and most likely never will be as anyone who leaves the archive has their mind wiped. Two of the Daleks that would ravage the earth colony on Vulcan. One of the Dalek time capsule’s that had been lost in their experiments had fallen through the time vortex and fell several hundred years in their past on the planet Vulcan. There it became buried in a mercury swamp. The time vortex had drained the ship and its 3 Dalek occupants of their power. Despite the Daleks now having a self generating power source, it had managed to disrupt it and rendered the Daleks comatose. They would remain under the swamp for well over a hundred years. In the meantime human beings would come to settle on the planet and build a large colony there. The Dalek spacecraft would eventually be discovered by the humans on Vulcan. This was before from the humans point of view the Dalek’s war with humanity so these human beings had no idea who or what a Dalek was. Their main scientist Lesterson whilst unable to repair the Daleks power generator within its casing was able to link the Dalek up to one in his lab which gave it a new power source. Unfortunately as soon as the Dalek came to life the first thing it did was exterminate one of Lesterson’s assistant. The murder was covered up however by Janley who wanted to use the Dalek for her own purposes. She was part of a group of rebels who wanted to take control of the colony. As soon as Lesterson revealed the Dalek to the colonists they were excited. 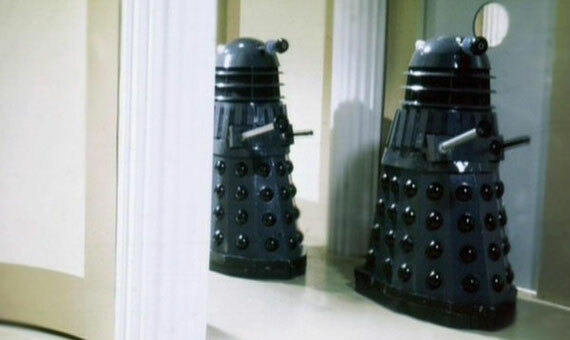 The Daleks pretended to be docile and friendly little robots even chanting “I am your servant” over and over again. Unfortunately for the Daleks the Doctor had arrived on Vulcan at the same time. The Doctor was travelling with his companions Ben and Polly two people from modern day England and he had just regenerated into his second incarnation. The Doctor tried to warn the colonists of the Dalek’s true nature but sadly they didn’t listen and the Daleks were able to manipulate them into giving them the materials they needed to create more Dalek casings as well as create an incubation chamber that could produce multiple Dalek clones. Very soon the Daleks had a full army and launched an attack on the humans whom they had managed to pit against each other. The Daleks slaughtered the majority of the colonists who were completely powerless to stop them including Lesterson himself who been driven insane with guilt when he realized only too late that the Daleks were monsters. Fortunately the Doctor would be able to defeat them once again when he managed using the device Lesterson had connected them too to give the Daleks a power overload destroying every Dalek casing on the colony. Unfortunately most of the colonists had been exterminated at that point though the few survivors tried to find a way to summon earth. Unfortunately for them after the Doctor left a single Dalek that had managed to survive exterminated the last of the colonists. It then managed to repair the Dalek time capsule enough to return to the Daleks own time. Upon returning the Dalek informed the Emperor that the Doctor had changed his appearance. When the Dalek first scanned the newly regenerated Second Doctor it was confused at first. The internal scan showed that he had two hearts a unique feature which only the Doctor had. The Daleks knew that the Doctor could somehow change his appearance as the CCTV footage of the 4th Doctor obviously looked different to the first doctor.. The Emperor of the Daleks soon began to view humanity as being the Daleks most dangerous adversaries. He had noticed that the Daleks had always lost against humanity all the time. Not only during their invasion of earth, but also almost all of the Doctors companions had been earthlings too. Believing that there was some quality that human beings had that allowed them to always beat the Daleks and wanted to try and isolate it. At the same time he still wanted rid of the Doctor and formulated a plan that would allow him to dispose of both humanity and the time lord. The Daleks soon detected another rip in the time vortex. Their own time machine had been destroyed by Ian and Barbara and it would take them a long to build another. The machine that had travelled to Vulcan meanwhile had been so badly damaged that it only was able to make one trip back. They still had the ability to trace damage to the vortex that was caused by time travel, but no actual time travel facilities left themselves. The Daleks hoped that if they could find this rip in the vortex itself then they might be able to find a time vessel as they knew that a rip in the vortex can only be created by a time machine. They headed towards the rip and discovered that it was actually a wormhole that had been created by a Victorian scientist named Edward Waterfield. Waterfield had attempted to try and find a way to travel in time but had instead simply created a rip in time which lead to the future. The Daleks made their way through the rip to Waterfield’s home era and captured his daughter. Threatening to kill her unless Watefield helped them find the Doctor and lure him into a trap, Waterfield with much regret had no choice but to assist them. Waterfield travelled forward to 1960’s London. The Daleks knew he would be here as they were able to once again track damage to the vortex which they realized had been caused by the TARDIS. Waterfield stole the TARDIS and lured the Second Doctor and his companion Jamie across all of London until he managed to gas them after which he dragged them through his own time machine which had been modified by the Daleks to Victorian London. The Daleks explained to the Doctor that they wanted him to try and isolate the human factor that had always allowed human beings to triumph over them and transplant it into the Daleks. The Doctor possessed a far greater technical knowledge than the Daleks and thus they wished for the Doctor to carry out these experiments. The Daleks threatened both Jamie his companion and Victoria’s lives unless he agreed to help them and faced with no choice he carried out their experiments and actually managed to isolate the human factor and transplant it into three Daleks. Christening them Alpha, Beta and Omega these Daleks became compassionate, emotional and even friendly and child like. After the Doctor, Jamie, Victoria and Waterfield were transported to Skaro the Emperor revealed to the Doctor that he no longer wanted the human factor. Considering the experiment a failure due to the Daleks human qualities he nevertheless now hoped to isolate the Dalek factor, the factor that makes Daleks ruthless, xenophobic and vicious. He hoped to transplant the Dalek factor into the Doctor himself making him their servant. The Doctor would then reveal all the secrets of his people to them and would using his time machine change the history of the planet earth by spreading the Dalek factor throughout all of human history. Though the Daleks had been wary of changing history they believed that if the Doctor was their servant he would be able to do it in a way that would not change their own history. Again with no choice as they threatened his friends the Doctor was forced to carry out their plan and the Dalek factor was soon transplanted into a human being named Maxtible. Maxtible had helped create Waterfield’s time tunnel. 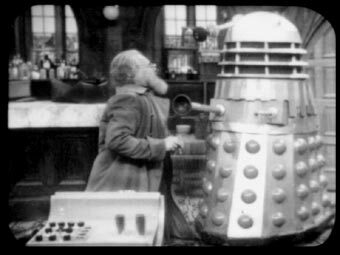 Unlike Waterfield however he served the Daleks willingly as they had promised him the secret of Alchemy. The experiment was a success as Maxtible became a Dalek in all but shape. The Emperor then attempted to transplant it into the Doctor, but the Doctor had managed to trick him. He had created the machine so that it would only work on human beings. With the Doctor being a time lord it did not work on him, but he allowed the emperor to believe it had. The Doctor freed the three humanized Daleks. The Emperor was scared that the human factor would spread like a plague across the Dalek race and the Doctor suggested to him that every Dalek should instead go through the Dalek factor machine. The Emperor agreed but unfortunately little did he know the Doctor switched it so that when the Daleks went through it they became infected with the human factor. With hundreds of Daleks now affected with the human factor they began to question the orders of the ruthless Dalek Emperor and a civil war soon broke out. Sadly over the course of the war Waterfield was exterminated by the Daleks. Dying in The Doctors arms the Doctor promised the dying man that he would look after his daughter Victoria. Jamie, The Doctor and Victoria managed to flee the city as it erupted into flames. The Doctor looked down as the city of the Daleks was completely and utterly destroyed in the war and told Jamie that he believed he had seen the final end of the Daleks. The Daleks were not completely destroyed but they had been driven to very brink of extinction. It would be a long while before they managed to rebuild and pose a threat to anyone again. Next up we will be taking a look at the second phase of Dalek history. We will see how the monsters managed to recover from the civil war, master time travel and build a new empire stronger than the one before it. This is the most wonderful Dalek history ever. Just one thing – your brilliant written expression is let down by some misuse of apostrophes. Would it be rude of me to offer to make those corrections for you, so that you can repost this amazing article with a really professional edge? Sorry for the late reply. Thank you for the kind words. Yes this article was done in a bit of a hurry and I haven’t had the time to go over it again. I am actually going back to edit a lot of my old articles and tidy them up. If you would like to help and offer any constructive criticism. You are more than welcome. Cool! Very well thought out. Doctor Who is one of the few shows where it’s POSSIBLE for everything to be canon, what with parallel worlds and time-wimey.